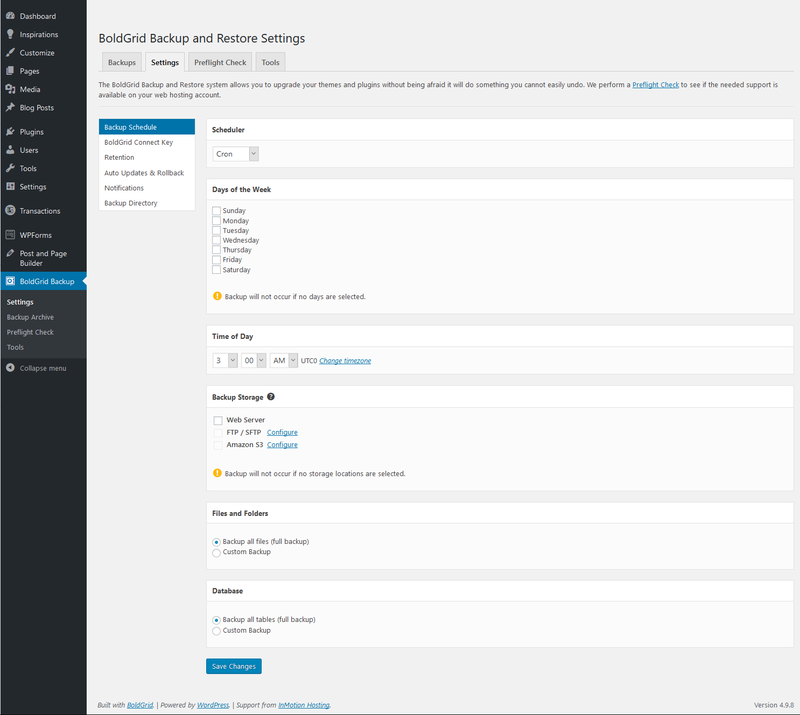 BoldGrid Backup includes many capabilities for security and disaster recovery such as backups before auto-updates. Below we cover how to schedule backups to a specified directory. Select Settings under BoldGrid Backup. In the Backup Schedule section, set a scheduler, Cron or WP Cron (if the cron service isn't on the server), days to backup, time of day, backup location, and files to backup. Select Retention to set the amount of backups to store. Select Backup Directory to change the storage location from /boldgrid_backup if desired. You'll be prompted to choose whether to move the backups so it'll still show under the Backups tab. Select Notifications to set an email account to receive notifications for backup completion. Your admin user email is set by default. You can also ensure your BoldGrid Connect Key is enabled. To learn more about BoldGrid, check out our BoldGrid Education Center. For more information on security, check out our lists of WordPress backup plugins and security plugins.